“A huge crop of grapes, from a summer with enough sunshine to ripen nearly all of them” was my original description of this classic warm vintage for Napa Valley Cabernet. Most 1997s were opulent and seductive early on, with noteworthy balance, sweetness of fruit and plush tannins. Naturally, the anti-joy division immediately predicted that they couldn’t possibly last. Admittedly, the wineries that provided samples for my group tasting of ‘97s this spring at Napa Valley Vintners in St. Helena were a group self-selected for quality. (Surely, many wineries declined to submit samples because their ‘97s are fading, but there were also others that simply had no remaining stocks.) And the wines I was able to taste came from what I assume was consistently careful storage, probably moved no more than once or twice—if at all—over the years. But with the exception of about a dozen wines that did not make my cut for 87 points, virtually all of the 50+ bottles I tasted were still full of life, and there’s no rush to drink the better examples. In retrospect, the vintage simply had too much stuffing and ripeness not to reward aging, especially from producers who took steps to keep yields reasonable. Heavy rainfall in January was followed by freakishly low precipitation totals and warmer than normal temperatures during the late winter and spring. Soils were warm and dry by the end of February, which triggered a very early budbreak, nearly a month ahead of normal for the time. The flowering was nearly as precocious – by mid-May even for Cabernet – and the fruit set was copious, setting the stage for a large harvest. June, July and August were then quite temperate, with the notable exception of a sharp heat spike in early August. It was a summer with less fog than usual, making for long, sunny days. Some estates started picking Sauvignon Blanc as early as August 10 and the Cabernets began coming in shortly after Labor Day. Virtually everything was harvested by the end of September, if not before the autumn equinox. But it’s important to note that 1997 was an early season, not a short season. Some light rain fell in mid-September but the best growers had thinned their crop loads in August and the remaining bunches were able to dry out quickly without rotting. Some producers may have panicked and harvested early but most were able to bring in consistently ripe fruit with full flavor development and mature skins. Those who harvested late, in some instances owing to a lack of sufficient tank space, risked falling acidity levels and skyrocketing grape sugars. Total tonnage for Napa Valley was nearly 20% above the previous ten-year average for the region. Early on, the wines were glossy and generous, with many of them offering striking accessibility. Consumers and professionals alike mostly raved. What few early critics there were suggested that the wines were so ripe and fleshy that they would not be long agers. They questioned the acidity levels in the wines and wondered if they had enough structure for the long haul. And of course they were suspicious of the very large quantity of wine made in ’97. The minority of wines that fell short in my horizontal tasting suffered from a range of deficiencies. In some cases, their tannins were not completely ripe even though alcohol levels were full. Other wines seemed a bit out of whack as a result of spiky acidity, which I suspect was due to acidification rather than to seriously underripe grapes. I also tasted a number of wines that have never really unclenched—or seemed to be in a state of suspended animation. This style of Napa Cabernet was much more common back in the late ‘90s than it is today. But the better wines have aged beautifully on their sheer strength of material and balance, and often show striking aromatic complexity, not to mention uncanny retention of fresh fruit. 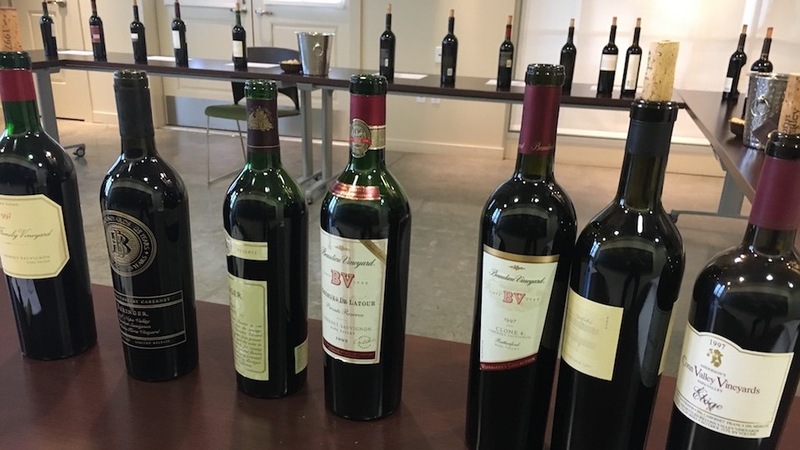 Some of the best ‘97s are from higher-altitude vineyards that enjoyed extra hang time owing to cooler afternoon temperatures and yielded more structured wines. For a year with wall-to-wall sunshine and a very early harvest, the 1997s are surprisingly classic in style, and I couldn’t help wondering if wines made today under similar conditions would be bottled with unwieldy alcohol levels.